GoodNight is Charleston’s family friendly New Year’s Eve celebration. It returns for its 23rd year this New Year’s Eve with music, dance and a good time for all. 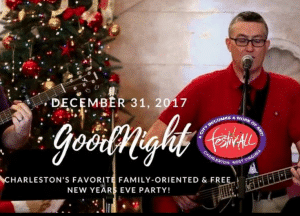 FestivALL is pleased to partner with Craig & Amanda Hinchman, City of Charleston, volunteer performers and more to present the 2017 GoodNight celebration in downtown Charleston. Enjoy performances by local chorus groups, bands, ballet ensembles, the WVSO and WV Youth Symphony, and many more individual ad ensemble artists at over a dozen downtown venues. And it’s all absolutely FREE! Thanks to the sponsors: City of Charleston and Mayor Danny Jones, Kanawha Valley Regional Transit Authority, Jim Strawn and Company, TSG Consulting and Charleston Blueprint. PreviousPrevious post:20 Things To Let Go Of Before The New YearNextNext post:Instagram vs Facebook: Which Can Boost Your Business More?